As many of you will know, the Castletownbere Development Association is a voluntary charity organisation made up of members from the local community. Every year we host many different events in Castletownbere for all the community to enjoy and also to bring revenue into our town. We will be holding our 2018 Annual General Meeting on, Thursday 22nd February, at 8pm in The Beara Coast Hotel. We would like to invite you to join us for a review of 2017 and to discuss our upcoming projects & proposals for the Year ahead. Please help to develop our town by getting involved and showing your support. Find out how you can get involved at a level that suits you. Bring your friends! Share your Ideas and Let's Work Together. 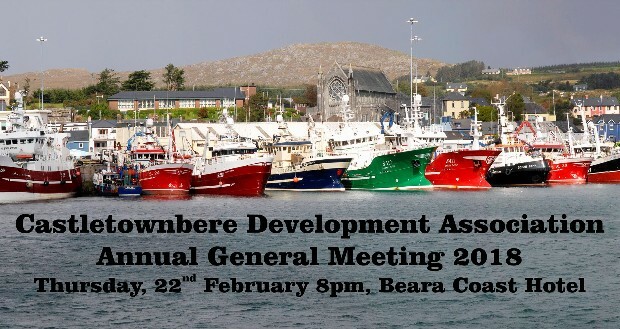 The Castletownbere Development Association AGM is to inform members of the local community about our previous year’s activities and hold an open discussion on how our town is and can continue to move forward. We want to talk to members of all different areas of our community, not just those in business, so please come along, bring your friends and get involved. Talk to us and find out why we became involved with the CDA, what our roles actually mean and what we get out of it. Getting involved can be at a level that suits you. It does not have to mean sitting on a committee or giving a huge amount of time. If you feel you'd be able to give a few hours directing traffic during one of our events, or if you can help hand out posters and flyers or something like that, please let us know! If the level of involvement you feel comfortable with at the moment is simply coming along and listening, then your attendance is most appreciated. That being said, we have been a very small committee for the last few years and we do need more members. Fresh people with fresh ideas and different skills to offer will keep the CDA going from strength to strength. We are perhaps best known for the organisation of the Castletownbere Festival of the Sea and other events. Whilst this in itself is a huge undertaking for a small voluntary group every year, that is not all we do! At the AGM there will also take place the reorganisation of the current committee. Some members will be for re-election and others will not be continuing, therefore we ask everyone with an interest in the progression of our town to come and vote.